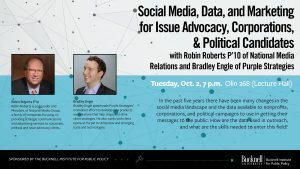 Come join us for a talk in Olin 268 (Lecture Hall) on Tuesday, October 2nd at 7 p.m. to hear from Robin Roberts P’10 of National Media Relations and Bradley Engle of Purple Strategies address the many changes in the social media landscape and the data available to nonprofits, corporations, and political campaigns to use in getting their messages to the public. How are the data used in outreach, and what are the skills needed to enter this field? Robin Roberts is co-founder and President of National Media Group, a family of companies focusing on providing strategic communications and advertising services to corporate, political and issue-advocacy clients. Since 1981, presidents, senators, governors, and members of congress, as well as major trade associations, non-profits, and Fortune 500 companies, have turned to National Media for their media initiatives. Mr. Roberts is also a founding partner in Purple Strategies, a bi-partisan corporate communications and reputation management firm based in Washington, DC. A native of South Carolina, Mr. Roberts received a degree in Journalism from the University of South Carolina in 1976. In 2004, he was named a Distinguished Alumnus by the School of Journalism, and currently serves on the Board of Governors of the USC Alumni Association. Mr. Roberts was the inaugural Advisory Board Chairman of the Bucknell University Institute for Public Policy, serving in that role for five years. He currently serves on the Advisory Board of BB&T Bank, as well as the Board of Governors of the 4A’s (American Advertising Agencies Association) Mid-Atlantic council. Bradley Engle rejoined Purple Strategies to spearhead Purple’s innovation effort to develop new products and solutions that help shape and drive client strategies. He also works with client teams at Purple to utilize new and emerging tools and technologies. Prior to rejoining Purple, he served as Digital Director for the Koch network’s public relations firm In Pursuit Of, and their largest grassroots group, Americans for Prosperity where he developed digital strategies that harnessed their 3.2 million activists to achieve educational, policy and political outcomes. Bradley also served as Digital Director for the Jindal for President campaign and Governor Jindal’s American Future Project. Bradley was previously a Senior Director at Purple Strategies where he worked in the firm’s digital practice with Fortune 100 companies and trade associations to develop and execute digital advertising and engagement strategies for branding, public affairs, and issue advocacy campaigns for clients. He has developed pioneering social media monitoring and online influencer outreach initiatives for clients in the defense, consumer goods, technology, and telecommunications industries. Bradley also worked for National Media Research, Planning & Placement, where he helped lead the firm’s digital strategy team and advised clients on digital media strategy in more than 50 races including work for Florida Governor Rick Scott, the NRCC and RGA. Bradley got his start in National Media’s media research department, where he utilized the firm’s proprietary media data to help assemble media research books on partisan media consumption habits. A native of Providence, R.I., Bradley graduated from the University of Wisconsin – Madison with a degree in Marketing.